Project Description: Customize thoughtful cards with Grafix Stencil Film. The image used to make the stencil for the cards was found on a vintage tablecloth. A black and white copy of the flowers was made; resizing them to fit on the cards, add registration marks at opposing corners for reference. Cut 3 pieces of Grafix Dura-Lar Stencil Film about 1 1/2″ around all sides, larger than the image. Lay a piece of the Stencil Film over the copy and outline the flowers using black permanent pen, also trace registration marks. Using another piece of film, outline the flower centers, also tracing registration marks. Trace the leaves using the last piece of film and trace registration marks. Use self-healing mat and Kraft knife to cut out traced images from film to make stencil set. Use Grafix Inking Palette to add and blend inks on. Add “lines” of Rosebud, Cupid and Orchid Pigment Inks from refill bottles on Inking Palette. Use Color Wheel and Handle to blend inks on palette. Use blue painters tape to adhere stencil to 6 X 6 piece of white card stock, also securing the card stock to a piece of scrap paper placed over foam sheet. Use Stylus & Tips and dab tip into blended ink, then tap into stencil, then heat set inks. Use Color Wheel and Handle to use excess ink on Inking Palette to create background on 6 X 6 white card stock. Roll vertically, then horizontally. Add Razzleberry and Heliotrope Inks to Inking Palette and use Color Wheel and Handle to blend inks. 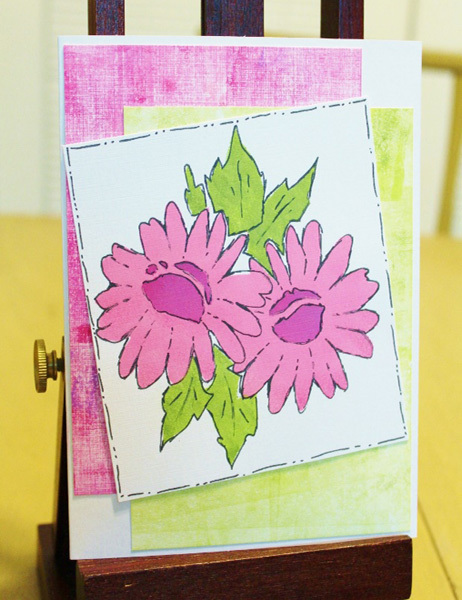 Use blended inks and Stylus & Tips to apply ink to flower centers. Use Color Wheel and excess ink to add another layer to background. 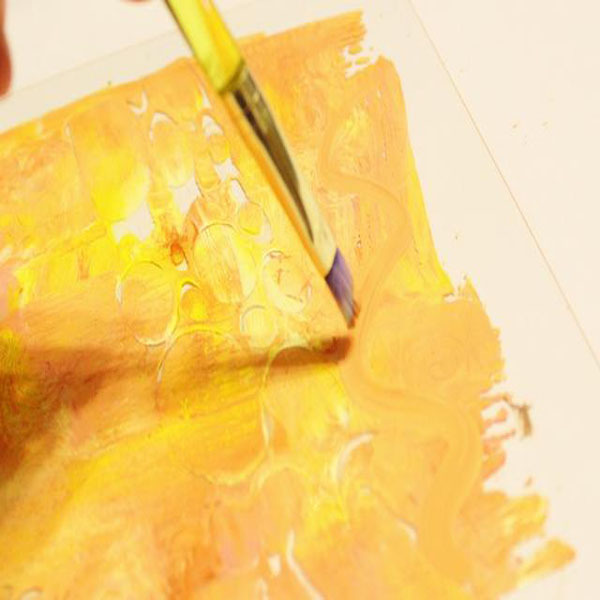 Use a clean sheet from the Inking Palette to add “blobs” of Citrine, Turtle and Pistachio Pigment Inks and blend using a cleaned Color Wheel. Use excess ink and Color Wheel to make green background. Tape on leaves stencil, matching registration marks. then ink leaves using a clean tip with the Stylus and heat set. Use fine tipped black pen to loosely outline stenciled flowers. Trim flower piece to measure about 4″ X 4 1/4″, then loosely outline around all edges. Let the heat set and then trim background papers to 4″ X 5 1/2″. Adhere pink background, then green background to front of blank card. Adhere stenciled flower piece at an angle to card front.